This last weekend Arisa, Ken, George and I took a little jaunt to Chicago. 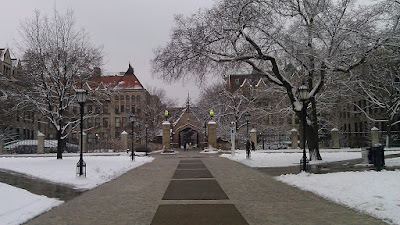 We were there for two different reasons: to visit the University of Chicago and take the Japanese Language Proficiency Test (JLPT). We left Saturday morning arriving in Chicago at around 1pm Chicago time. Other than me connecting to other flights at O'Hare, it was the first trip to Chicago for all of us. I gotta say, I was impressed with this city which is probably not surprising. The first thing we did was to check in at the Courtyard Marriott at Midway. After chillin' for a bit, we then went on to see the University of Chicago. Great looking campus. We walked around for an hour or so to get a sense of the place. We checked out one of the libraries, Science I think, and looked at the Athletics facility which was, not surprisingly, really nice. While we were there, we noticed a Waseda University banner in one of the cases. This banner caught our eye largely due to the fact that Arisa's father and sister both attended Waseda. Taking a closer look, it seems that in the first couple of decades of the last century, every five years the U of C baseball teams would travel to Japan to play baseball against Waseda. 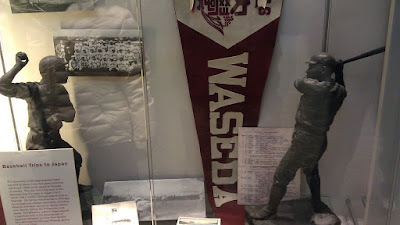 The following year, Waseda would travel to the U.S. to play the Maroons. 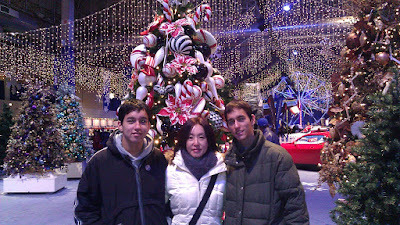 After University of Chicago, we drove up to the Navy Pier. 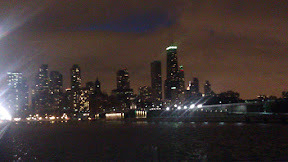 Now while it seems to be tourist trap, it also seems to be great place for Chicagoans to visit as well. Based on many of the people I saw there, it wasn't only tourists, but local residents as well. Just walking around this place and driving from U of C to the Pier along the Lake Shore Drive (route 41), Chicago has done great things with their waterfront. Even Arisa asked why isn't Cleveland more like this and why do we ruin our waterfront with a damn airport. It's an excellent question. I have heard Chicago's use of waterfront before, but until you actually see it in person, the point doesn't really hit home. Well, it hit home on this trip! But that's a different post. The Wunder Winterfest was being held at the Navy Pier. We didn't know that going in, but we took full advantage of it. We walked around for about 45 minutes. It was really cool with slides, food, Christmas Trees, ice skating, and other activities for kids. After the Navy Pier, we started back towards the hotel with full intention of stopping somewhere for some Chicago-style pizza. As I mentioned, this was our first time to Chicago, and it seemed appropriate to try Chicago-style pizza for the first time too. So before leaving I looked up on Yelp for a pizza joint near our hotel. 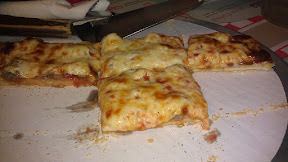 The one I found was called Citriani's Pizza and had very good reviews. So that's where we went and it was less than 5 minutes from the hotel if I recall correctly. We ordered both a thin crust (sausage) pizza as well as the Citriani's Special deep dish pizza. You can see the yelp reviews here and another set of reviews here. 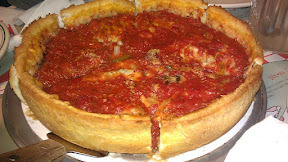 The balance of ingredients was nice on both items, but particularly the deep dish. I think I ate the thin crust when it was too hot so I spent more time trying to cool my mouth off than anything else. 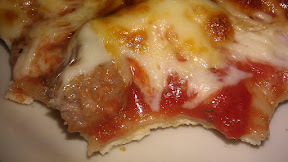 With the thin crust pizza the quality of the sausage was very apparent - probably the best I've had. 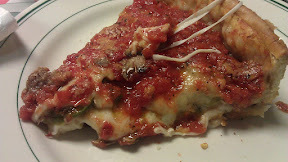 I think I liked the deep dish pizza better. 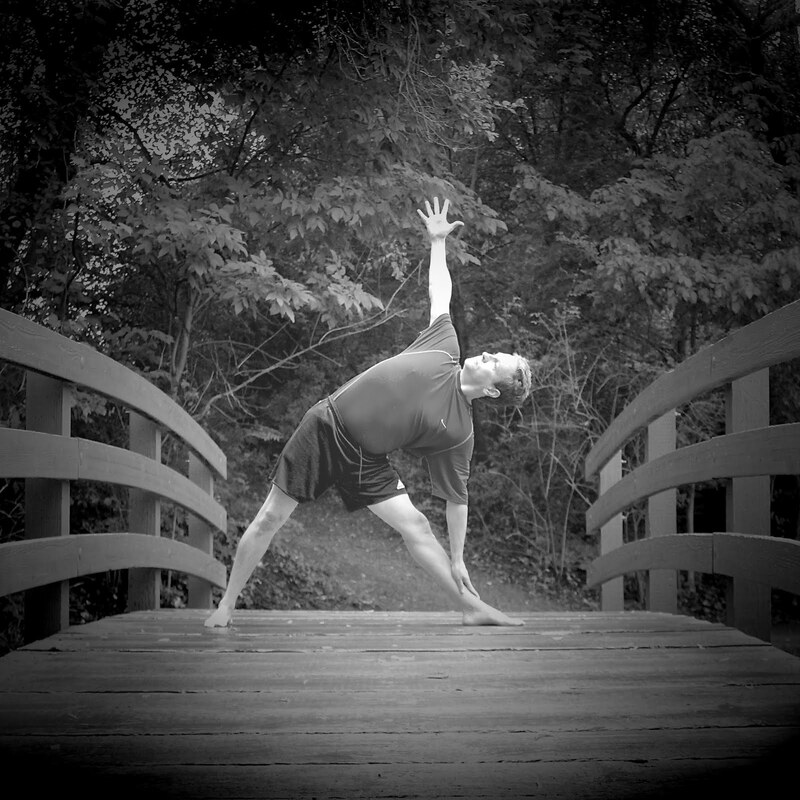 The balance was very good and each of the ingredients added to the overall flavor. And even though we only ordered small pizzas, together they were more than filling and we couldn't really have eaten more. I did get a kick out of the fact that in two of the reviews I read they talked about local Chicago Police eating there. And I was not disappointed to find them there while we were there. Clearly it's popular with local law enforcement. On Sunday, we spent time walking around the Watertower Place mall. Different from the sprawling malls like Beachwood Place around Cleveland, this mall was fairly small on a per floor basis but had something like 7 or 8 floors to it. Ken, George and I left Arisa at the Watertower Place so she could window shop around the surrounding neighborhood (packed with shoppers and lots of stores), to go take the test at Depaul University. We finished around 4:30. We picked up Arisa from where we left her off and head home to Cleveland. Though it was a short trip, we had a really good time walking around. We were there just long enough to want to go back. For a slideshow of all the pics from the trip see: Chicago Trip.